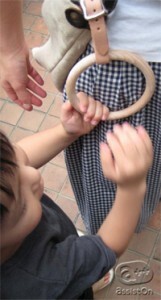 If you have a small child, you may have a situation like when you walk outside with your child, sometimes you are holding stuff in you hands and can’t take the child’s hand. There is a Japanese product for a situation like that. It looks like a strap in trains and busses but look at the pictures below. 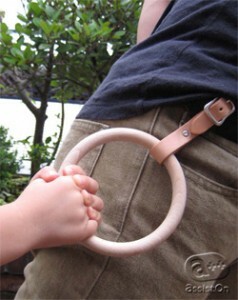 It can be attached on a bag or belt and a child can hold it. 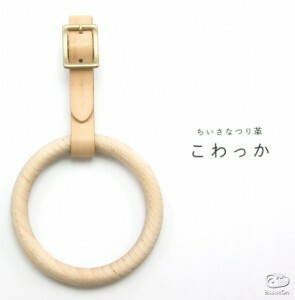 The person who designed this is a female designer, Rina Ono. She explained how she came up with this idea. 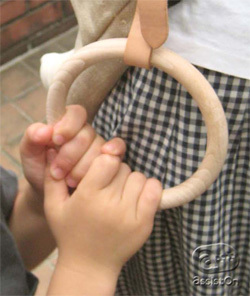 Because the ring is made of wood, it has the warmth of wood and it’s a little smaller than the actual strap in train. It was all made by standing children’s point. So why don’t you try it? If you are interested in the product, please CONTACT me!